The Swimmer opens with a moving shot through the woods. A deer runs away as though startled. A rabbit too. Branches are pushed aside. A stream burbles. Is this a POV shot, you wonder? Meanwhile, the credits roll. An ever so slightly odd start to a studio picture from ’68, but you’re reading the credits, you don’t make much of it. Now we’re moving over the tops of the trees and there’s a man down there wearing nothing but swimming trunks, walking through the woods and up to the edge of a secluded swimming pool behind a large house. He leaps in, swims a few laps, when a highball glass is lowered into frame in front of his face. A man greets him, seemingly a good friend of swimmer Ned Merrill’s (Burt Lancaster). They talk about this and that, and soon the man’s wife is revealed sitting in a deck chair—has she been there all along?—and she too is happy to see ol’ Ned, and everything’s just fine, aside from the fact that this movie began with a guy appearing from the woods and leaping into somebody’s pool. Have a drink, Ned, your first of many. This is notably strange, but not so strange you dwell on it. It’s there, and you note it, and you figure it’s nothing—soon the story will reveal itself and that’ll be that. But that is not that. Ned’s friends mention some other folks who live nearby who’ve had a new pool put in, and suddenly Ned grows intense and distant. He peers out over the tree-filled valley and the fancy houses dotting it, and snaps back to the present with an amazing plan. I’m not going to tell you Ned’s plan, because it’s so perfectly odd I’d hate to spoil it. But it’s at this moment you understand the movie’s opening is no accident. This is not the studio melodrama you assumed it was. This is going to get surreal. Without revealing the specifics of Ned’s plan, Ned’s going to spend the day getting himself home. This will involve other houses, other swimming pools, and his interacting with various people from his life. As he does so, we begin to see cracks, big cracks, in Ned’s version of reality. Ned speaks often of his wife and two daughters. Reactions suggest there’s a story behind his family Ned’s keeping from us. Or is he keeping it from himself? How long has it been since anyone’s seen Ned? Is Ned even in this movie? Is this Ned’s dream? His ghost? Does anything that happens actually happen, and if not, what in the hell is going on? The beauty of The Swimmer is, one, that these questions occur watching it, and, two, that there are no answers provided. With a little time and creativity, many, many theories of what’s going on in this movie could be successfully argued. Maybe Ned represents the fears of the people he meets. Maybe he represents the fears of the audience. Maybe he’s you. As to what The Swimmer is about, it’s about a world of shallow wealth. It’s a world Ned’s very much a part of, or was very much a part of, or one he desperately wants to be a part of, or one that, if it ever existed, does so now in a state of decay consuming everyone who touches it, Ned prime among them. At one pool he meets a young woman, Julie (Janet Landgard), who years ago babysat for his daughters. She always had a crush on Ned, and now? Well, now she’s a hot young thing in a bikini. Ned invites her to join him on his journey. She accepts. Thus begins a sequence you’d expect in something like Phase IV, the super-intelligent ant movie. Julie and Ned are shot walking through the woods, always at a distance, with blurring and oversaturated colors, their faces almost always obscured, their conversation all in voice-over, to the point you feel like you’re watching a soap commercial shot by film-savvy late ‘60s hippies on acid. Or by smart bugs hiding in the shrubs wielding Panavision cameras. 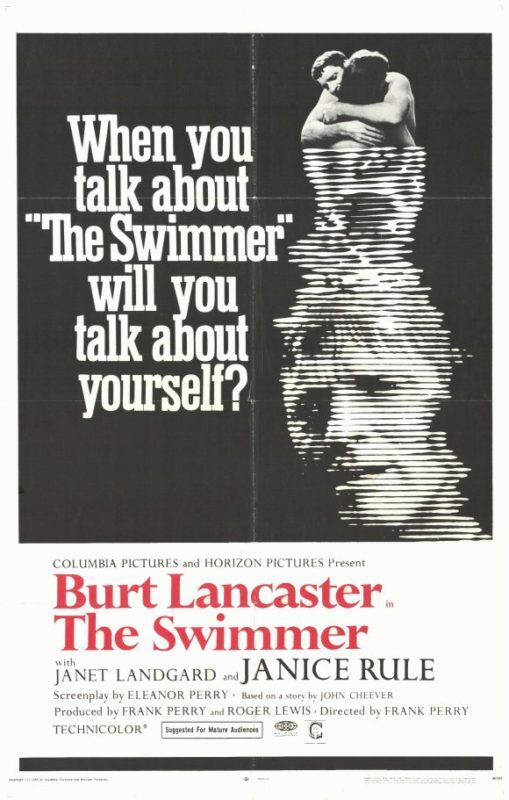 Frank Perry directed The Swimmer from a script by his wife, Eleanor Perry, adapted from a short story by John Cheever. But troubles abounded and Frank Perry was fired after delivering his cut of the film. A young Sydney Pollack, about a year away from directing the wonderfully odd movie They Shoot Horses, Don’t They?, and friend of Lancaster’s, was brought on (uncredited) to re-shoot key scenes. Frank Perry would go on to direct a curious few films, including Diary of a Mad Housewife (’70) and Mommie Dearest (’81). 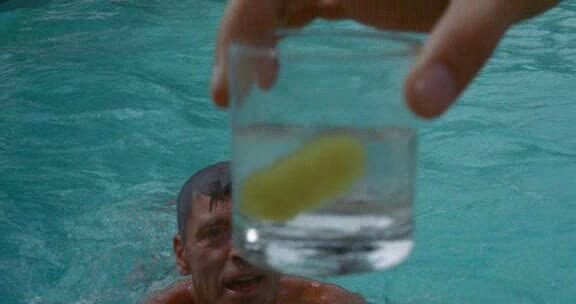 Nothing he made was quite like The Swimmer. Lancaster gives one of his best performances. It’s not as flashy as Sweet Smell of Success or Elmer Gantry, but he is deep into the mind of Ned. No matter who he meets, no matter how angry they are with him—and many are indeed very angry—nothing will prevent him from completing his mission. It’s an intense, focused performance. Ned travels to his dark side, but not until the end does he realize it. I’m having a hard time thinking of anything quite like The Swimmer, at least cinematically. Makes sense it was based on a short story. It reflects a kind of literary disillusionment with the ‘50s ideal of wealth and leisure reflected in books like Joseph Heller’s Something Happened and Richard Yates’s Revolutionary Road. It springs from the same kind of middle-class misery of a failed life that Frankenheimer’s considerably more disturbing Seconds does. Which isn’t to say The Swimmer is a happy movie. It follows its premise all the way home. It doesn’t let Ned—or you—off the hook. Did I fail to mention the scene where he races a horse? The Swimmer is exactly the kind of movie I can’t believe I only just saw. It’s a perfect example of a movie that, because it failed to find an audience when it was released, never stuck in the wider cinematic consciousness. But love for this movie runs deep. It was recently put out on blu-ray by Grindhouse Releasing, known for deluxe editions of grisly horror movies like Pieces, Cannibal Holocaust, and underground spaghetti western classic, The Big Gundown. If they’re the ones who saved The Swimmer from obscurity, you know its weirdness must run deep. The late ‘60s were a confusing time for movie studios. They didn’t know what to do or how to do it. Lucky us! 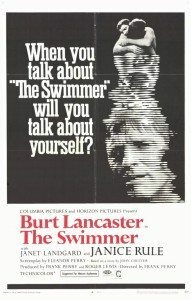 The Swimmer was too weird for the mainstream, and not freaky enough for the counter-culture. But that was then. Now you can enjoy it for what it is: A dark, funny, surreal descent into one man’s fractured soul. Well I will have to watch this, then.